Liberty University men’s division I (DI) hockey, ranked No. 7 in preseason American Collegiate Hockey Association (ACHA) polls, battled their Sept. 19-20, 1-1 weekend series split versus the No. 12 Naval Academy in the mind as much as on the ice. The teams last met in the second round of last year’s ACHA National Championship tournament. 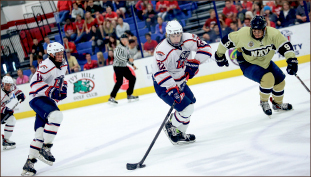 The then-13 seed Midshipmen stunned the fourth-seeded Flames with a 4-3 overtime win, ending their season early and providing extra incentive for Liberty. The Flames took the ice Friday, favored at every position, but ended the night in a 5-4 shootout loss. After jumping out to an early lead on goals from forward Colt Steele and defenseman Chase Harris, play on both ends of the ice turned rough. Heightened emotions, building aggression and a near-frantic pace found Liberty in the one spot from which they couldn’t score: the penalty box. In 60 minutes of regulation play plus five minutes of overtime, the Flames acquired a total of 42 penalty minutes — including a 10-minute misconduct. Despite two more goals from forward Luke Hannon and linemate Luke Simon, the Midshipmen converted power plays and mutual man-down situations to even the score, take the game to shootout and get the win. Each of the players echoed Handy’s promise. Less than a day later, despite the frustrating loss, they made good on it. In a show of maturity, the Flames controlled the game Saturday afternoon from puck drop to final buzzer, posting a 6-2 win over the Midshipmen with pace and patience in stark contrast to the night before. Swallowing the emotion of the first game and skating away from frequent opportunities to fight, the Flames focus provided them a 2-0 lead midway through the second period on a power-play goal from forward Lindsay LeBlanc and a solo goal from defenseman Danny Logan. When Navy snuck in two of its own, tying it up early in the third period and looking to push the pace back to a frenzy, the Flames kept their heads and retaliated with a four-goal scoring spree. The Hannon, LeBlanc and Simon line contributed on three and forward Colt Steele netted another. The adjustment, however obvious it may seem, took character in the heat of a historically charged matchup. Handy expressed his pride in the team for their rebound. The Flames will look to bring that mindset to the ice next weekend against Ithaca College Friday and Saturday, Sept. 26 and 27, at 7 p.m. and 3 p.m., respectively.